LAHAN, Aug 21: An environment expert and engineer has urged for Chure conservation in view of the devastating flood in the tarai region every monsoon. Unless illegal extraction in the Chure range comes to an end, flood and landslides in the plains and the hills cannot be averted, they warned. “There are around 12 big rivers that flow through Saptari district, which stretches 43 kilometers from east to west. 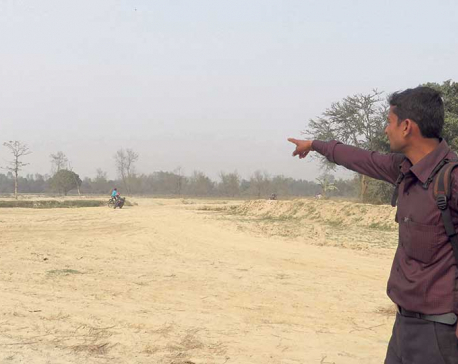 Rivers have started spreading to greater areas due soil erosion,” says Ram Naresh Mandal, chief engineer at the Water Induced Natural Disaster Office of Lahan. “If this goes on, this district might turn into a riverbed,” he added. He explained that floods bring stones, sand and mud which get deposited at the bottom of the rivers. As the depth of the rivers get filled with the materials, water flows beyond the river banks during monsoon. “And that is how nearby settlements gets inundated by water,” he stated. Locals believe that Mandal's worry is quite relevant. According to Dharma Narayan Raya of Tilathi village, rivers have been widening gradually. In fact, they are flowing haphazardly. “We have noticed that the rivers are flowing strangely. Until 15 years ago, we could easily cross the Khado river. Now, that's not possible,” he noted. He feels that almost all the rivers in the tarai have grown the same way. Earlier, they were following certain course and were narrower, unlike now, he says. “For instance, the Mahuli river has nearly doubled in size,” he stated. Locals are worried over the change seen in those rivers. They feel that something wrong is happening with nature. “We have been facing flood since several years. But every year, it is becoming different. Water enters settlements so suddenly,” said Raya. Engineer Mandal calls it a disastrous sign. Rising level of rivers is due to Chure devastation, he says. “Such rivers pose danger also to bridges along the East-West Highway. If this issue is not taken seriously, even severe devastation can occur,” he stated.